Glenfiddich, the world’s most awarded single malt Scotch is announcing their continued support for Wounded Warriors Canada by donating two dollars for every bottle of our Glenfiddich 15 Year Old Solera across Canada. 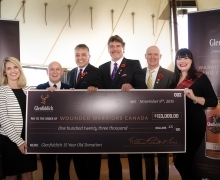 In honour of the ongoing partnership, Glenfiddich is changing its regular packaging throughout 2013 and beyond to help raise awareness and funds for Wounded Warriors Canada. 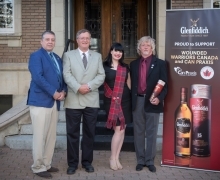 Glenfiddich’s fundraising efforts for Wounded Warriors Canada began in October 2012 with a record-breaking charity auction of an ultra-rare bottle of Glenfiddich 55 Year Old, Janet Sheed Roberts Reserve. Continuing with these efforts, as of January 2013, all funds raised by the $2 dollar bottle donation on every bottle of Glenfiddich 15 year old Solera sold across Canada will be celebrated annually with a donation presented each November. The rebranded bottle will be on store shelves in August but the donations have been rolling in since January 2013.